This year, to enhance the service that this post has evidently provided, I have written a number of other essays that are meant to corroborate various claims made within the post. Hopefully, these essays come soon enough for people to find useful for the Easter 2013 season. The original post, and the complementary essays, can be read on this site (links below) but have also been compiled into an ebook (cover to the right). I have a couple of other claims that I’d like to eventually corroborate, so this collection of essays could grow. 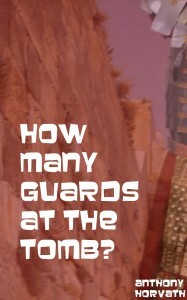 Were they Roman Guards or Jewish Guards? I pray you a Blessed 2019, & that this communication finds you well. I have heard it told that Roman Guards we’re burned alive in their armor for ‘allowing’ prisoners to escape on their watch. I have been unable to find any evidence of this in my research. I am unaware of that specific punishment for that particular transgression, but that doesn’t mean it isn’t listed somewhere. The Romans were indeed brutal in their punishments, including when they ‘allow’ prisoners to escape on their watch. You can find several instances where severe punishment, including death, is meted out to those who failed in their guarding duties. In that link I refer to Currie’s “Military Discipline of the Romans” (ISBN: 978-1936830-99-2) which is about as comprehensive of a list as you are going to find, but even he only offers summaries. If someone tracked down the full text of the incidents he described, you may in fact find guard burned alive in their armor. I see in one case, a deserter was burned, but without tracking down the full text, I can’t say whether it was in his armor or out of it. My suggestion would be to start with my own link above and then pick up Currie’s book and roll up your sleeve. The evidence you seek may very well be out there. Let me know if you find it!